In late spring artist Jared Small exhibits An Epoch (a moment in time), new paintings on panel and mylar at David Lusk Gallery - Memphis. 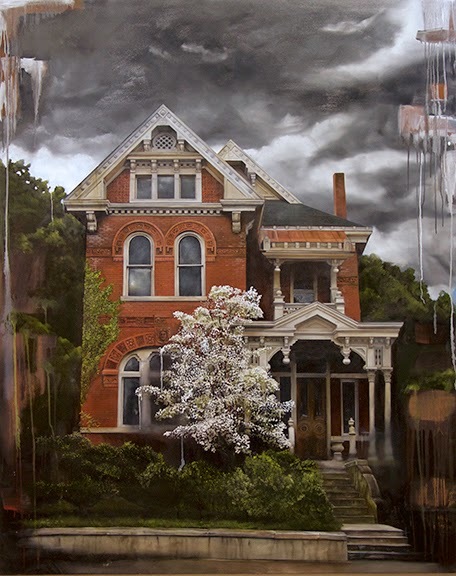 The paintings explore the dramatic evolution of time reflected through aging homes that permeate Southern neighborhoods and in a group of lushly abstracted floral still lifes. Another element of the show is Small’s time-lapse video-progression imagery matched with a number of the paintings. The impetus for Small’s show is the recent awareness that over a period of years he took random photographs of the same Victorian mansion. With study he deciphered subtle differences in the landscape of the photos – ivy cut back on the brick of the building and then overgrown, a dead tree in the yard eventually cut down to the trunk, and over time shiny new paint slowly flecked away to expose rotted wood. 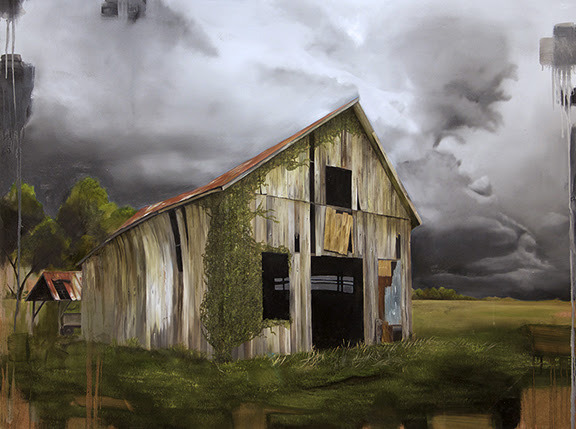 Stormy, 2015, oil on panel, 36x48"
The fascination took hold, and stroke-by-stroke he created the painting Mollies, following the same chronologic stages of his photographs. The result – through stages -- is a hypnotizing representation of time, catching the viewer between the realities of the obvious image and the possible mysteries that lay beneath the surface. In order to absorb the full experience, Small demonstrates the progression of the subject matter’s transformation on panel through time-lapse electronic software. On electronic tablets viewers will witness the mansion in Mollies go through the same transformation Small saw in his photographs. He applies this same method to several other works in the show, giving the ability to witness clouds rolling in while greenery dies away in real time. A subset of works in the show is a large-scale series of flowers that actively wilt in Small’s magical realist painting style. Three monumental paintings on panel represent fall, winter and spring. The center of each painting focuses painstakingly on the accuracy of the image while the background dissolves into abstract elements that devise an emotional and dramatic interpretation of the subject. 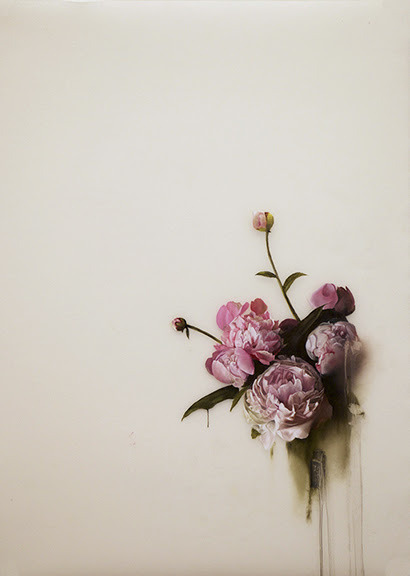 Pink Peonies, 2015, oil on mylar, 30x20"
The self-taught artist Jared Small lives and works in Memphis. His work has been acquired by many public and private collections including the monumental allegorical painting, True Blues, that is part of Nashville Music City Center’s permanent collection. Small’s 6x8 foot painting of The Good Samaritanstory was in the traveling exhibition “Ashe to Amen” in 2013, organized by the Museum of Biblical Art in New York City. David Lusk Gallery - Memphis is located in Laurelwood between Perkins Extended and Grove Park. Gallery hours are Tue-Fri 10-5:30, and Sat 11-4. For further information or visuals, contact Brittney Shedden at 901-767-3800 orbrittney@davidluskgallery.com.